Mark and Jeremy did the do-deca-pentathlon back in the summer of 1990, when they were teenagers. It consisted of 25 events, a fierce competition between two brothers who took it very, very seriously; it ended in a draw, during the very last event, when their father shut the whole thing down. The do-deca left them "embittered and estranged," according to the opening crawl of the Duplass Brothers' The Do-Deca-Pentathlon, on such bad terms that Mark hasn't invited Jeremy to his birthday weekend. Jeremy shows up anyway. "Surprised to see me?" he asks, and Mark replies with a sharp and immediate "No." It is perhaps appropriate that this story, which concerns the very height of sibling rivalry, is being told by two brothers (who say it's based on a real event, though not one they shared). The Duplasses understand how siblings relate to each other, how power positions are defined early on and are seldom if ever shed, and the dynamic between these two brothers is clear and well defined: Jeremy pushes, and pushes, and pushes, and Mark resists initially (and wisely), but eventually succumbs. Jeremy doesn't turn up at their mother's house that weekend with the idea of returning to the do-deca; he mostly seems to have come because he's offended he wasn't invited, and he'll be damned if anyone's gonna tell him where he can and can't go. But he finds an old tape that they made that fateful summer, and opens up the old wound, insisting that he actually won, since it was Mark who their dad pulled out of the water during the breath-holding event. "It doesn't matter," says Mark's wife Stephanie (Jennifer Lafleur), "so tell him that he won." Mark can only get the first half of that out. Jeremy sees that his brother's competitive streak, which he's stifled with years of therapy, is still easily accessible, so he brings up the idea of doing the do-deca again. 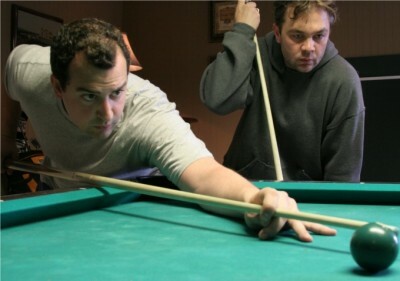 Mark refuses, but they somehow end up playing pool and ping-pong in the middle of the night. Jeremy leaves a note under his brother's door, with the slots for keeping score of the remaining events. "You can't stop this now," he writes at the bottom. "You and I both know it." This is the kind of story you could easily imagine being at the center of a big, dumb studio comedy, a lesser Will Ferrell vehicle or (shudder) an Adam Sandler picture. That movie would seize on the idea of two grown--and not terribly healthy--men indulging their pubescent selves, and it would have a lot of sports slapstick. There's a bit of that here (the Duplasses do love the incongruity of matching up their antics with hero music and slo-mo), but they're ultimately more interested in the power dynamics--not just between the brothers, but in the us-vs.-them tactics they find themselves adopting to get away with actually doing such a ridiculous thing. Their primary antagonists turn out to be not each other, but Stephanie and their mom, who know what they're up to, and why it's such a bad idea. The Do-Deca Pentathlon was shot clear back in 2008 (before the filmmakers did Cyrus and Jeff Who Lives at Home, more mainstream efforts with established stars), and it has a handmade feel that is both endearing and occasionally problematic--a little of the clunky zooms and shabby handheld goes a long way. But those visual cues also indicate the pictures' debt to Cassavetes, which becomes clearer in Mark's later scenes with Stephanie; there's a gravity to their interactions, a recognizable reality that feels more like a grounded drama than a broad comedy. The Duplasses know how brothers interact, but they also know how married people talk; there's something particularly recognizable in their discussion of his need to lose weight, a scene that gets, beautifully, the way an innocuous and jokey conversation is used as a trial balloon before wading into something heavy and problematic. That's a great scene, and one that is about more than its subject. Buy tickets to "The Do-Deca-Pentathlon" now!